international studio LAVA has broken ground on an energy storage tower in southwestern germany. the project seeks to transform a cylinder-shaped water tank into a dynamic sculpture to serve as a new landmark for the city of heidelberg. fully open to the public, the structure — which is due for completion by mid-2019 — will provide information on sustainable power and renewable resources. solar and wind energy generated on site will be used to heat up the water inside the tower, which will then be sold. commissioned by energy company stadtwerke heidelberg, LAVA’s design replaces the site’s gas tank — a symbol of energy policy from the 1950s. referencing geometric forms found in nature, the building’s multi-layered façade sits in front of an insulating layer of mineral wool panels in different shades of blue. a spiral staircase, positioned on the outside of the tower, rises dramatically to the top of the structure. the outer façade comprises a network of cables and approximately 11,000 diamond-shaped plates of stainless steel, which rotate in the wind. this constantly evolving envelope changes appearance depending on the season or time of day as waves of light and motion glide across its surface. at night, the inner envelope is illuminated with blue, green, and white LEDs mounted below the stairs. 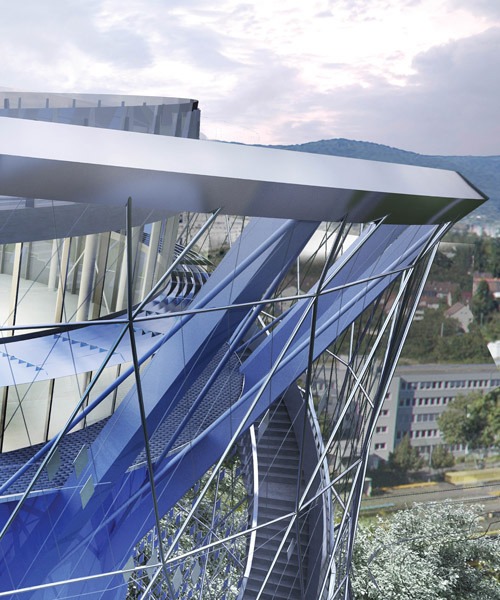 from ground level, two elevators take visitors to event spaces on the roof, while a small restaurant and open-air terraces offer views across the city from the top of heidelberg’s new tallest building.